An airspace infringement occurs when an aircraft enters controlled airspace without receiving the appropriate ATC clearance. The problem of airspace infringement is a serious risk to aviation safety and the risk is particularly serious when the infringing aircraft involved is a general aviation light aircraft as the majority of these aircraft are not required to carry appropriate transponder equipment. This means that major surveillance safety nets (eg ATC control, TCAS) that help prevent mid-air collisions are ineffective. 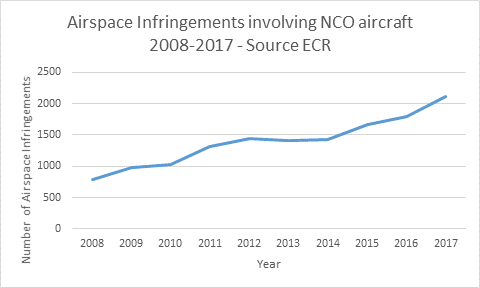 EASA has reported that the number of airspace infringements across Europe has increased significantly over recent years, albeit there is no such increase in airspace infringement rate evident in Ireland, due to the relatively simpler airspace structure in Ireland compared to most of Europe. As part of the pan-European mitigating measures to help address the problem of airspace infringement, the EASA Safety Promotion Network (which includes the IAA) has launched a General Aviation Airspace Infringement Safety Promotion Campaign, see https://www.easa.europa.eu/airspace-infringement. This campaign is also published in EASA Flying Safely and accessible from the EASA Safety Promotion and General Aviation portals. The campaign includes links to entertaining and informative videos, posters, banners and guidance and the IAA strongly recommends that general aviation training schools, clubs and pilots should be aware of, and promote, this material to help reduce the risk of an airspace infringement or mid-air collision.